You want to know the secret reason my clients hire me? But the secret reason? Because of a little bit of fear. Isn’t that why we hire experts? Someone who knows more than we do, can tell us from their experience the right thing to do or say, and will get us out of a jam (if we ever find ourselves in one). Sometimes diving into posting on social media platforms feels like talking to the popular crowd. Do you find yourself wondering if you are saying the right thing, using the right hashtag, mentioning the right people? Do you find yourself thinking: “is everyone watching?” and yet also thinking: “oh my, what’s the point, no one is watching!” ? Have no fear my fellow social media students (we are all students this stuff changes all the time) I want to tell you 7 steps (and a bonus!) you can take to boost your social media confidence online right away. 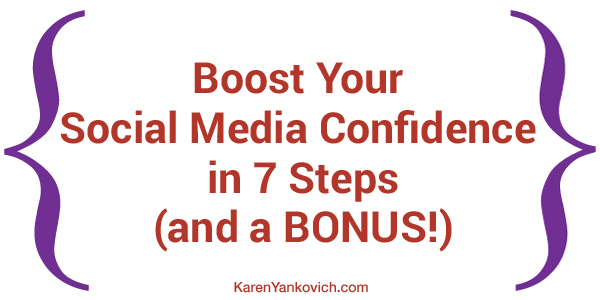 7 steps and a bonus to boost your social media confidence! First: Get yourself a great headshot. A professional, classy, and well done headshot gives you instant expert quality. Invest in a professional photographer along with hair and makeup to get an instant online confidence boost wherever you see your photo. Believe me others who view you will also get a confidence boost in you and your skills. Check out what one of my business partners’ says about ‘your portrait’, I love the way she explains the power of a professional headshot! Second: Make sure you have a polished and professional LinkedIn profile. Take that headshot and update your LinkedIn image! This platform is where most of the professionals ‘hang out’, and if you want an instant confidence boost take the time to clean up, add to, update and revise your LinkedIn profile until every time you look at it you want to hire yourself! I’m not kidding those words were used by a novice LinkedIn user after signing up for my LinkedUp in 30 course that walks you through step by step how to make your LinkedIn profile shine. Sign up here! Do your research and join a local group of successful entrepreneurs and business professionals. These local groups can be a great way to gain new clients and attract new partnerships but you also get a chance to talk about who you are and what you do over and over again in a small, less “threatening” group dynamic which boosts confidence when you translate that well rehearsed ‘pitch’ to social media. A confidence boost also comes from consistently spending time with successful people. I know you’ve heard the saying, ‘You are the average of the 5 people you spend the most time with” so hang out with successful business owners you wish to emulate! Across all of your social media position yourself as if you are peers with the most influential in your industry. This is EASY to do on one of my favorite platforms, the democratic Twitter. Connect and engage with these influencers on Twitter as well as on LinkedIn, which is another great place you can reach well known, even famous, people in your niche, and they very well might engage with you right back! Think of the confidence boost then! I love Twitter especially for that very reason – where else could I “talk” to Oprah? Gain confidence by spreading the word about you and your business far and wide through other people’s networks. Guest posting will help you be seen by a larger audience and then watch your fan base grow. The more you talk or write about what you do the better you get at explaining it, selling it, and showing your value to others, namely those followers that turn into clients. Sixth: Sign up for HARO. This gem of a resource allows you to get emails from reporters all OVER who are looking for experts to quote in their articles and other media. HARO stands for Help A Reporter Out, and sure enough there are enough topics to go around – I get a few emails every day! Get quoted as an expert and watch your confidence quotient hit the sky! Seven: Make sure a component of your social media plan is to grow followers. As your followers grow, your confidence will too. More people will be ‘nodding their heads’ along with you as you post about your business and beliefs on social media and that is a great confidence boost. For some great tips on how to grow your followers check out a few of my blog posts: here, here and here. OOH and I like this one: here. Bonus #Eight: Build your confidence by always practicing the first seven seconds of your speech or video post. For all of you YouTubers and Periscopers out there – it is proven that the first seven seconds of a speech is where you make the most impact – use that time wisely! Boost your confidence on social media by making videos that use humor, empathy, and share valuable information that will drive fans to you. With new platforms and apps it’s never been easier to get into the world of video social media posting! Which is your favorite confidence booster of the list above? Need some support? Come on, you know it’s always easier with support right?! Join me, and other business owners and entrepreneurs like yourself, in my LinkedIn Group. We look forward to discussing our favorite confidence boost in the group soon – see you there! Karen – my favorite is the reminder that the first 7 seconds of a ‘presentation’ are critical as to whether someone will continue listening or watching. It really forces you to be ON immediately. I liked all of them. They are unique to what I’ve heard elsewhere. My favorite is the HARO tip. I have never heard of HARO, and will definitely check it out, but I’m not sure I’m clear on how you use it. Could you expand just a bit, please? Thank you very much! Thank you for the insight. This is exciting! Karen – I appreciate the 7/8 tips on gaining confidence with social media. As my network continues to grow, it becomes easier to see what resonates and promotes engagement. My next step is to up my game on blogging. I like the fact that you remind us that communication is key and also to make sure we engage with influencers on a daily basis. Thank you for your blog post, Karen, Helpful as always :).